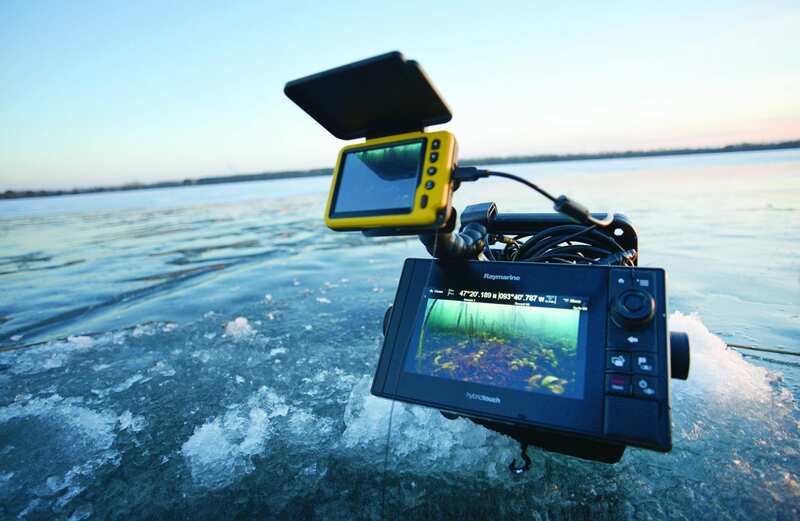 Paired with video-enabled sonar units like Raymarine’s new Axoim Pro or eSeries, an Aqua-Vu underwater camera becomes the ultimate fish-finding machine. Whether it’s under ice or on open water, watching the fish and your lure in real-time takes the excitement of sight fishing to another level. It also gives obvious advantages to the angler. With Aqua-Vu, you’ll know exactly what fish is down there and be able to adjust the presentation to home in on what action triggers the fish to bite. But that’s just the beginning. All anglers know how important water temperature is to finding feeding fish. Probes equipped on the camera reveal water temperature at the depth you’re fishing, which can be markedly different from the temperature at the surface. With that information, it is easier than ever to find the conditions you’re looking for. Aqua-Vu can be plugged directly into a Raymarine sonar unit and viewed on the screen. This sonar, GPS and video combination is a powerful tool to make you a better angler, and they can all be viewed at the same time. Identify structure with sonar, drop a camera down to see exactly what it is and what species are holding on it, and then mark it on the GPS. It can all be achieved on the same unit.